Preheat oven to 350 degrees. Spray square baking pan (9×9) with non-stick butter spray. Crush one cup of graham crackers and add melted butter – form crust in the bottom of the pan. Mix together: sugars, vanilla, egg, and softened butter. In a separate bowl combine the salt, baking soda and flour, once mixed combine with other mixture. Gently stir in the mini marshmallows and chocolate chips. Place dough on top of graham cracker crust. Bake at 350 degrees for 20 minutes. 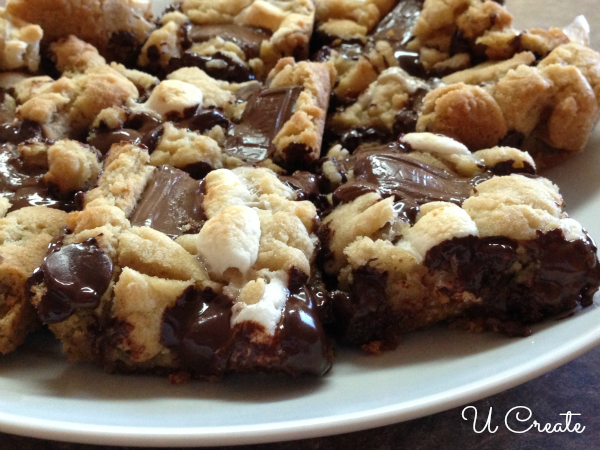 Place Hershey bar pieces on top and bake for an additional 5 minutes. Cool and cut.